The state will spend $226 million for 80 more M-8 rail cars from Kawasaki Rail Corp. for Metro-North Railroad's New Haven Line, Gov. M. Jodi Rell announced Tuesday. The state Department of Transportation is putting the first group of prototype cars through on-track testing to correct flaws before producing the rest of the state's earlier $760 million order of 300 new rail cars from Kawasaki. The state and Metro-North are paying for the trains. The cars will replace the state's rundown fleet of M-2 and M-4 rail cars, most of which date to the 1970s. The additional order will include spare parts and specialized tools needed to maintain the entire fleet, and it will also cover the installation of security cameras aboard all of the 380 cars, according to Rell's office. Rodney Chabot, a New Canaan commuter and member of the Connecticut Rail Commuter Council, said the decision to act on the option to build the cars made sense given that manufacturing the trains in Kobe, Japan, and Lincoln, Neb., should start soon. "This is absolutely great news," Chabot said. "As long as they have the assembly line going, we might as well build them now because it's cheaper than having them start it up again at some later date." In May, the first set of eight M-8 rail cars made its first independent run between New Haven and Milford, when then-DOT Commissioner Joseph Marie said he expected production models of the rail cars to begin coming off assembly lines in greater numbers in the near future. Marie said in May that the DOT planned to have the fleet of 300 cars in service by October 2012. 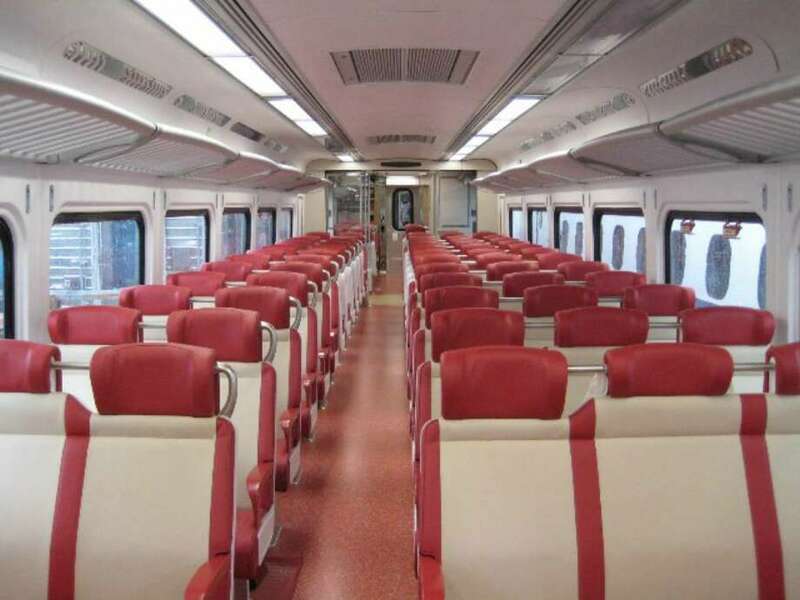 The commitment to order additional cars is also notable for Metro-North riders because it would include replacements for the New Haven Line's existing eight M-2 bar cars, rail advocates said. "That's going to make the commuters very happy to hear that," said Andrew Todd, a South Norwalk commuter and Connecticut Rail Commuter Council member. The state completed a new four-track acceptance facility at the New Haven rail yard in July. Rell's office released a statement that she would announce the additional cars in New Haven on Tuesday. Representatives from the DOT and Rell's staff did not return calls for comment. Rell asked the State Bond Commission last week to authorize borrowing $260 million to pay for double tracking a line between New Haven and Springfield, Mass., a project that would cost $880 million. That new funding request will be considered at the commission's Aug. 11 meeting at the Capitol. The DOT is expected to file an application with the Federal Railroad Administration this week for an additional $220 million toward the New Haven to Springfield line, officials said. State Sen. Eileen Daily, D-Westbrook, a member of the State Bond Commission, said she isn't aware of whether Rell plans to request the $226 million for the additional 80 cars from the panel later this month. She said she is concerned that taking on the nearly $500 million in debt to cover the high-speed rail bonds and buy the additional cars might crowd out other transportation projects. "That's an enormous expense that has to be properly vetted," said Daily, co-chairwoman of the Legislature's Finance, Revenue and Bonding Committee. "We have to look at both the rail-line improvement and other acquisitions and measure that against other projects." Andrew Todd, a South Norwalk resident and member of the Connecticut Rail Commuter Council, said buying an additional order of cars is a responsible action to ensure the state will have enough seats as it tries to promote rail commuter travel as an alternative to driving. "The new cars are beautiful, and it will just make it that much more attractive to ride the train," Todd said. "I think it is a great investment toward making Connecticut a place to do business in, and the more cars, the merrier." Staff writer Martin B. Cassidy can be reached at martin.cassidy@scni.com or 203-964-2264.